The three most common causes of loss of vision in older people are cataracts, macular degeneration and glaucoma. 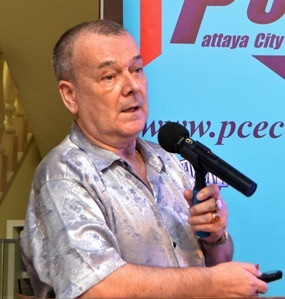 Dr Bundit Leetanapon, an Ophthalmologist from Bangkok Hospital Pattaya, spoke about common eye diseases affecting the elderly at the Sunday, May 15, meeting of the Pattaya City Expats Club. In an eye that is functioning properly, Dr. Bundit said, the lens focuses light directly onto the retina, which is at the back of the eye. If the lens becomes clouded, this can cause blurred vision. This condition is called a “cataract.” In addition to blurred vision, other symptoms of cataracts include increasing difficulty seeing at night; increasing glare and halos around lights; needing frequent changes in eyeglass prescription; seeing colours that are faded or yellowing, and having double vision from a single eye. Dr. Bundit describes to his PCEC audience the intraocular lenses, either mono-focal or multi-focal, that are used to replace the clouded lens that is removed during cataract surgery. Dr. Bundit explained that there are four common causes of cataracts: age (the most common cause); congenital (some babies are born with cataracts or develop them in childhood); other health issues, such as diabetes, steroid use or high myopia; and trauma to the eye caused by an injury. Dr. Bundit cited a study that showed that 8.3% of people in the 43-54 age group have cataracts. For the 55-64 age group, the number is 26.5%. The number goes up to 56.7% in the 65-74 age group; and to 70.5% in the 75-86 age group. More women than men have cataracts in the 43-54 and 55-64 age groups. In the other two age groups, more men than women have cataracts. People are more likely to develop cataracts early if they have one or more of the following risk factors: smoking, alcohol use, diabetes, high myopia or excessive exposure to ultraviolet sunlight. Dr. Bundit answers several questions posed by his PCEC audience about his presentation, noting that many symptoms of eye disorders can be the result of different diseases; thus a complete eye examination is needed to identify the causes. The treatment for cataracts is to replace the lens. Dr. Bundit described two commonly used procedures: extra capsular cataract extraction (EECE); and phacoemulsification (PE). The latter is the technique most often used in developed countries. PE involves using ultrasound to emulsify the existing lens. EECE involves the removal of almost the entire lens. With EECE, there is a large entrance wound and a long recovery period. With PE, the entrance wound is small and patients recover more quickly. After the removal of the cataract, an intraocular lens is usually implanted into the eye. There are two types of intraocular lenses: mono-focal and multi-focal. Mono-focal lenses provide vision at one distance only: far, intermediate or near. Most patients choose far, which means that they will still need glasses for near vision. Dr. Bundit further explained that the multifocal lens has several rings of different powers built in. The part of the ring you look through will determine if you can see clearly at far, near or intermediate distances. A multifocal lens is recommended in most cases. However, they are not recommended for patients who have unrealistic expectations of how well they will be able to see at different distances; and people who are heavily dependent on their night vision (e.g. pilots, truck drivers). 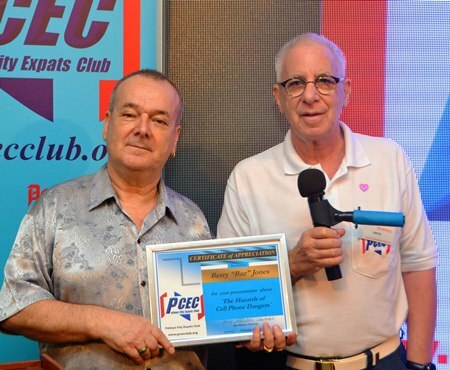 MC Roy Albiston thanks Dr. Bundit for his informative talk symptoms, diagnosis, and treatment for cataracts and macular degeneration as he presents him with the PCEC’s Certificate of Appreciation. Additionally, he said that with the use of multi-focal intraocular lenses, 80-90% of patients do not need glasses after surgery. A few will need glasses for specific activities, such as working at a computer or reading in a dim light. Immediately after surgery, some patients will experience some glare and halo around lights at night. However, most patients adapt after a few weeks. Dr. Bundit then talked about age-related macular degeneration (AMD), which is a medical condition that may result in blurred vision in the centre of the visual field. It is caused by the deterioration of the central portion of the retina. Dr. Bundit stated that a complete eye exam is required to diagnose this condition. The most important risk factor is smoking. Other risk factors are a poor diet, obesity, a sedentary lifestyle, high blood pressure and exposure to the sun. 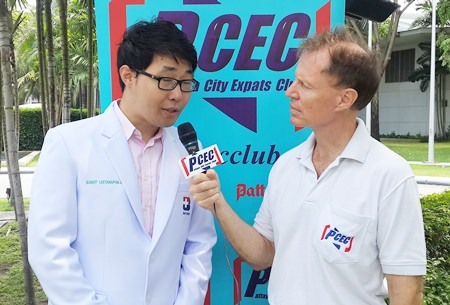 Member Ren Lexander interviews Dr. Bundit about his presentation on eye diseases of the elderly to the PCEC. The video can be viewed at https://www.youtube.com/watch?v=SVw2trlEsuM. The symptoms of AMD include central scotoma (a dark empty area in the centre of vision); and metapnorphosia (distortion of the central vision). Vitamin and mineral supplements may help to prevent AMD, specifically vitamins C and E; beta carotene; zinc and copper. Dr. Bundit closed his presentation noting that he would not be talking about glaucoma as it was a subject that needed more time than was still available to cover. During the Question and Answer session, some asked Dr. Bundit about specific symptoms; in most cases he responded that the symptoms could be the result of more than one eye disease and that a thorough eye examination would be needed to identify the specific condition. 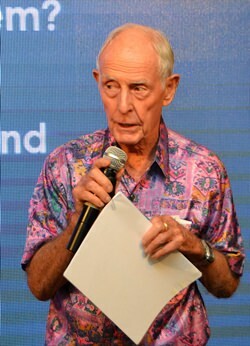 After the presentation, MC Roy Albiston brought everyone up to date on club activities and happenings around Pattaya before calling on Ira Wettenstein to conduct the Open Forum, where questions are asked and answered about Expat living in Thailand, especially Pattaya.